CASE STUDY 2: SUPER SHUTTLE DRIVERS VOTE CWA. After a two-year fight for a union, Super Shuttle drivers at Denver International Airport voted overwhelmingly for CWA representation. Overcoming two years of hostility, harassment and coercion, 94 Super Shuttle drivers at Denver International Airport finally got the chance to vote for a union. In a resounding victory, they voted 77-4 for representation with CWA Local 7777, which also represents 300 Union Taxi drivers at DIA. The mostly African immigrant group filed their original petition for a union election in December 2009. Attempting to frighten its drivers and derail the vote, Super Shuttle management claimed the workers were independent contractors and therefore ineligible, terminated a driver on the organizing committee, and committed numerous other unfair labor practices. CWA prevailed in seven ULPs it filed against management, with the NLRB eventually directing the election. 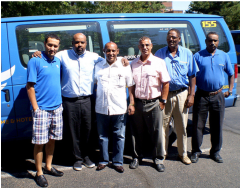 It further ordered Super Shuttle to refund the drivers $65,000 in franchising fees, which the company had collected as retaliation for their union activities. District 7 Organizing Coordinator Al Kogler said Local 7777 organizer Abdi Buni, a former Union Taxi driver at DIA, did an “incredible job” of holding the Super Shuttle drivers together, and local President Lisa Bolton provided critical support. Besides drivers at Super Shuttle and Union Taxi, CWA represents 125 other DIA workers, including 70 at Avis and Budget rental car, and 45 at WallyPark, the airport’s parking lot company.